December is the month of festive light, our way of preparing for a bleak midwinter. It’s the time of year when menorahs are lit. Trees are decorated. Extension cords are strewn across yards and gables. And electrical code is forgotten. At a museum, however, we can put on a light show of our own. All with the tried-and-true technique of using ultraviolet light to examine our artifacts. 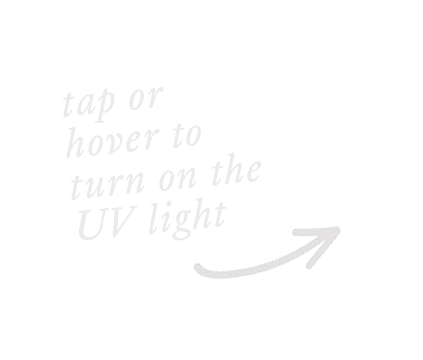 Ultraviolet (UV) light is radiation at a wavelength sandwiched between visible light and x-rays. * Technically neither you nor I can see ultraviolet light. But objects emit visible light when exposed to it and different elements emit light differently. 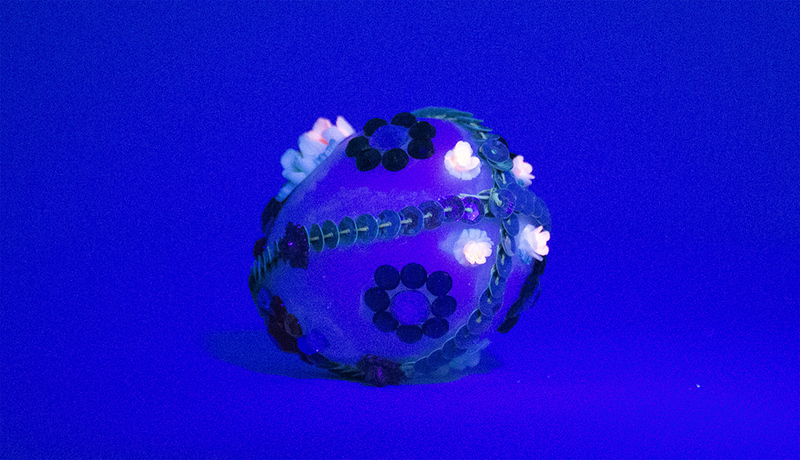 This difference in fluorescence allows us to see the composition of objects in a unique way, revealing hidden stories in our artifacts. Let’s take a look. * Caution. This is science as explained by a curator with training in art history, not electromagnetic radiation. 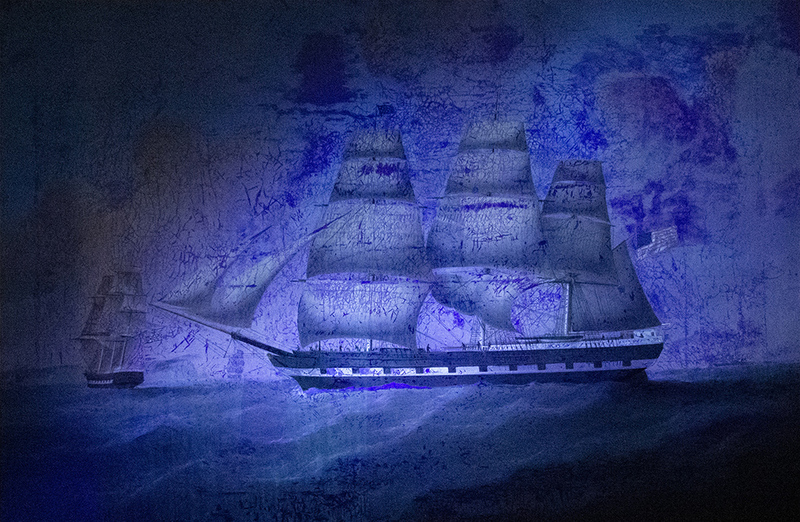 UV light reveals a different and complex story—the pockmarked history of the painting itself. What is this mess we are looking at? Oil paintings typically are covered with a varnish to preserve and seal the work. If applied evenly and preserved intact, varnish appears as a haze under UV light. However, cracks can develop in a painting over time; sometimes restoration work attempts to hide this deterioration and other damage by careful repainting. But paint on top of varnish fluoresces differently from paint underneath varnish. All the darker blue areas you see in the sky, sails, and waves are from later restorations that are mostly invisible to the naked eye. Sometimes UV light reveals something rather surprising. This painting is well preserved. But there’s something going on below Mr. Sewall’s eyes, making it almost look like he has readied himself for a baseball game with eye black. The dark strokes below the eyes are the result of paint being added after the varnish. Comparing the natural and UV images reveals that the paint in question was a rosy hue that further defines his cheeks. The paint was deliberately added, rather than evidence of restoration work. Apparently after the painting was completed, it was decided to add a bit more color to Mr. Sewall’s face. When commissioned to paint a portrait, artists are (generally) keen on pleasing the person with the checkbook. 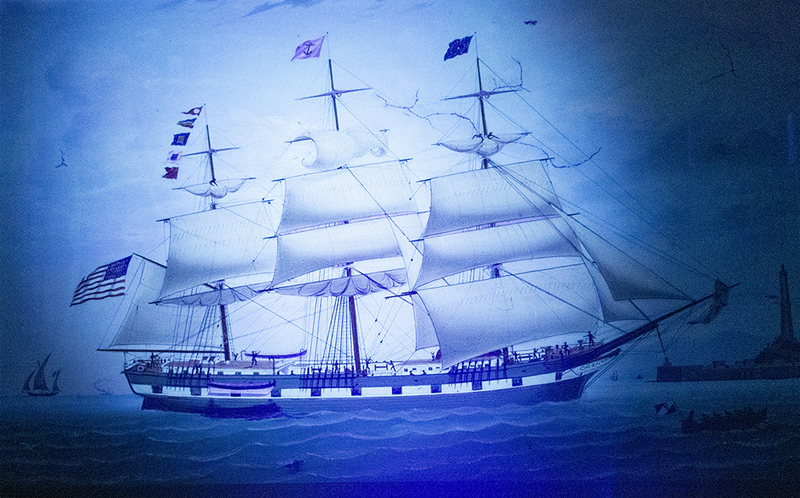 UV light reveals some tears in the painting between the foremast and mainmast. But the more interesting revelation here is what is going on with the ship tenders—the boats hanging on davits near the aft of the vessel. It is subtle in this image, but they fluoresce differently from the rest of the painting; they likely were added later. There is also evidence of significant alterations along the DeSoto's waterline directly below the starboard tender. Was the tender originally lowered? Was it never there in the first place? Accomplished port painter Michele Renault painted this portrait of the Patten vessel DeSoto entering Genoa harbor. 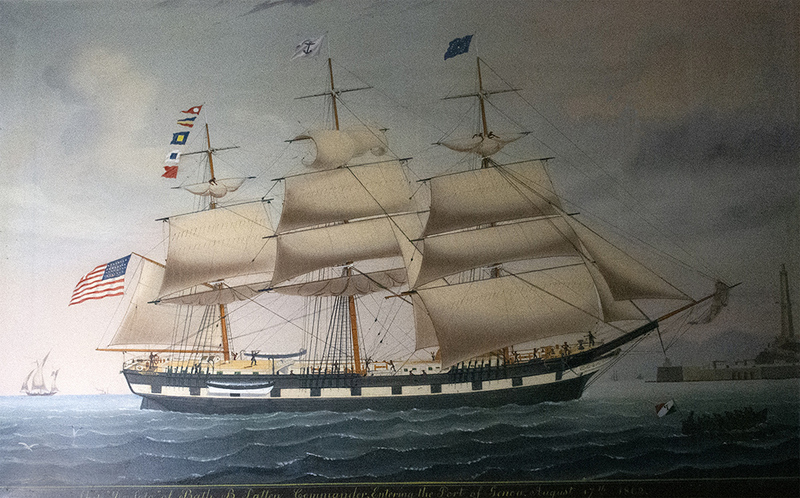 Renault added the date of the arrival (August 17, 1862) at the bottom of the painting, a consideration that later maritime historians are grateful for. Like the Pelican State painting, this shows the DeSoto requesting a pilot; here the Italian pilot boat is visible at the lower right. 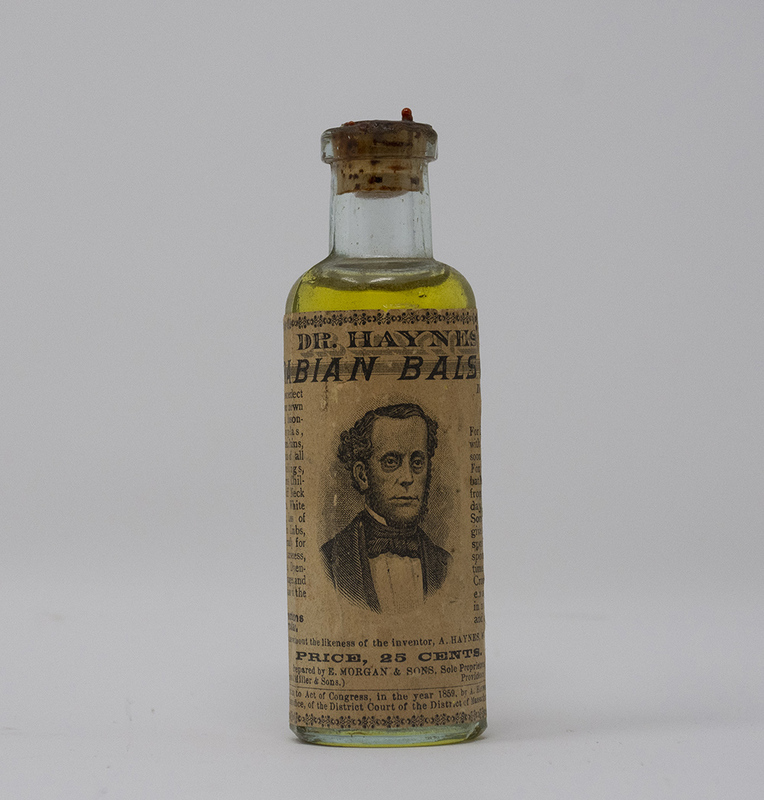 This bottle of Dr. Haynes’ Arabian Balsam is a veritable panacea, promising to cure burns, erysipelas (skin rash), poisoning, and “loss of motion in the limbs.” It evened functioned as a laxative. Dosage was to bathe with it twice daily (for burns) or take a teaspoon of it 3-5 times daily (for everything else). An analysis under UV light confirms that, yes, this is pretty much a bottle of “bland vegetable oil.” Canola oil, and vegetable oil in general, has a distinctive turquoise glow that we are looking at here. 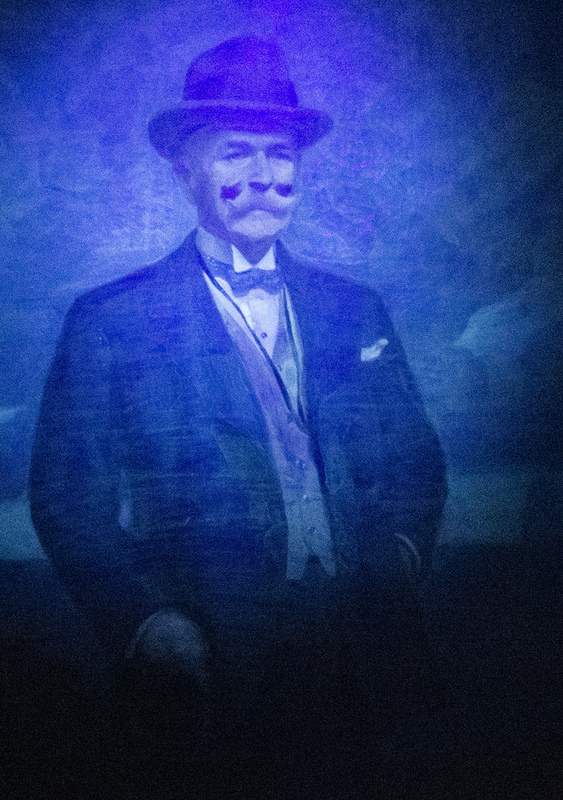 And Dr. Haynes himself looks even less trustworthy under UV light. This is an odd thing—an egg decorated with sequins. It doesn’t seem particularly functional, nor particularly masterful. 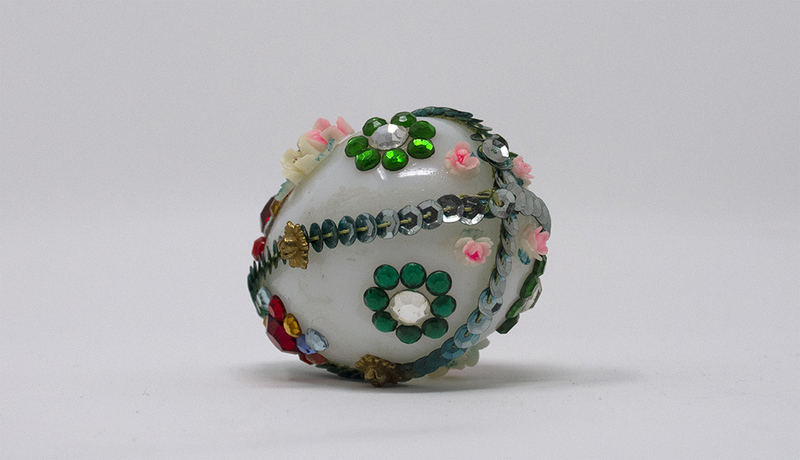 Victorians called these sorts of objects bric-à-brac; we call them trinkets or tchotchkes. A brightly colored egg like this was fun decoration for a middle-class mantel or bookshelf, with its glittering faux gems and bright pink rosettes. Under UV light these rosettes light up a neon hot pink, the color of 1980s leg warmers. This is one of our most fluorescent artifacts and it is due to the dye used in the pink pigment. The bright color was “Madder lake,” a solution made from the root of the rubia plant. “Madder lake" fluoresces this unique neon color. 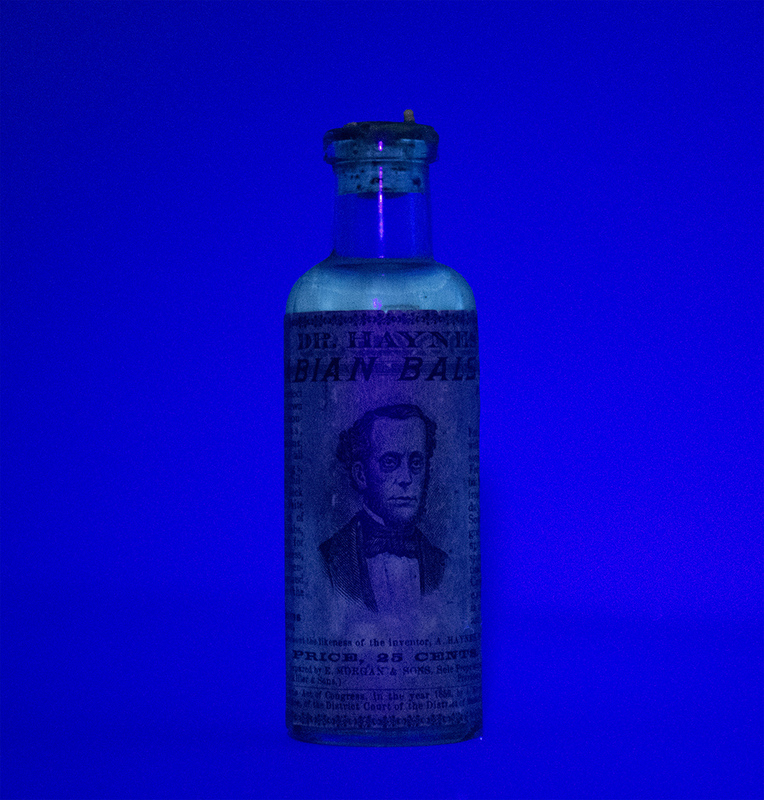 Another “bright fluorescer” is vaseline glass, a glass popular from the 1880s–1920s that glows a bright green under UV light. This glow is because uranium was added to the glass mix. 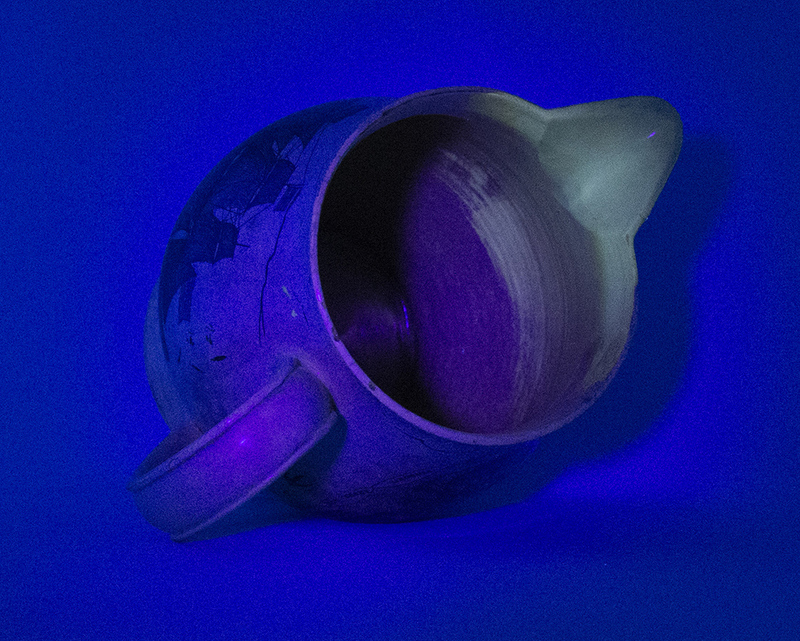 In this case, UV light allows us to see how the pitcher was made. Areas where a lead glaze was added are a dark blue, whereas the unglazed ceramic is a pale green. 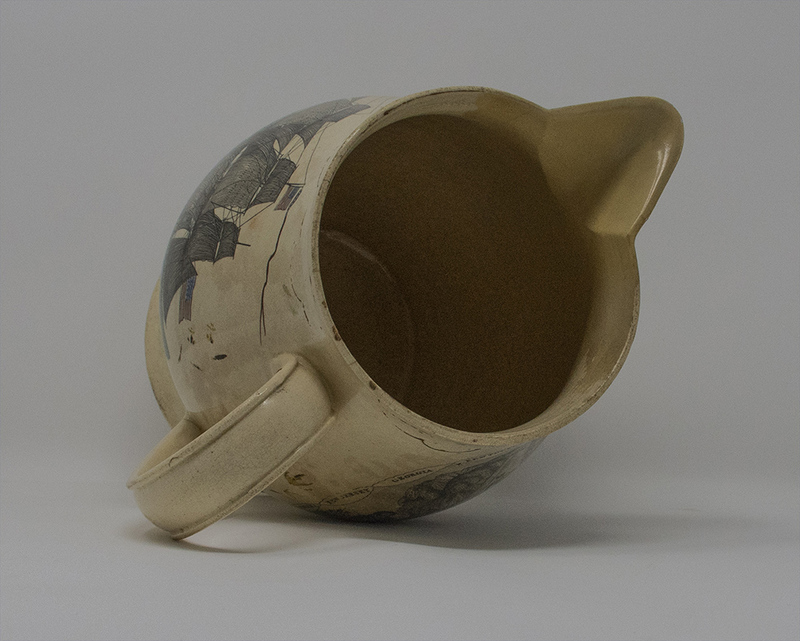 It appears that the spout was added to the pitcher after it was glazed and a section of the inside was also left unglazed. This is not ideal—glazing not only makes the surface more durable, but it effectively seals the porous ceramic. This patriotic pitcher celebrates the American Revolutionary War. 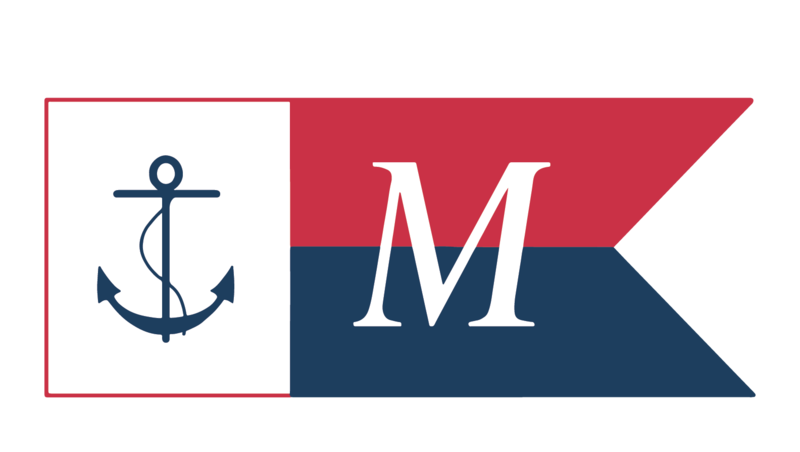 On one side it depicts an American frigate, at the time the most visible symbol of American military might. On the other side it depicts George Washington ascending to heaven in glory, deified like a Roman emperor. This type of ceramic is called creamware because it was made with white clay and covered in a pale lead glaze before firing. And ironically, this pitcher that celebrates American victory over Great Britain was produced in Great Britain, at Liverpool. 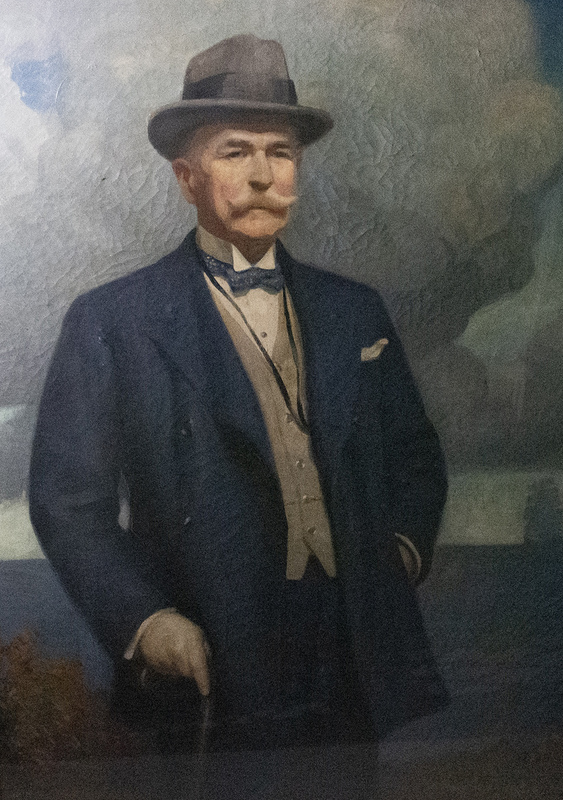 This is the political powerhouse Harold Marsh Sewall (1860-1924), an instrumental figure in the annexation of Hawaii. This portrait was painted by Truman Fassett, an artist who rose through the ranks of the art world studying in New York, Boston, and Paris. Fassett painted a great number of coastal landscapes, but also would paint a portrait for the right price. This is a rather serene painting of Pelican State, built at Bath in 1851 by Levi Houghton & Sons. Overall it looks like a nice day, with partly cloudy skies and a moderate sea. 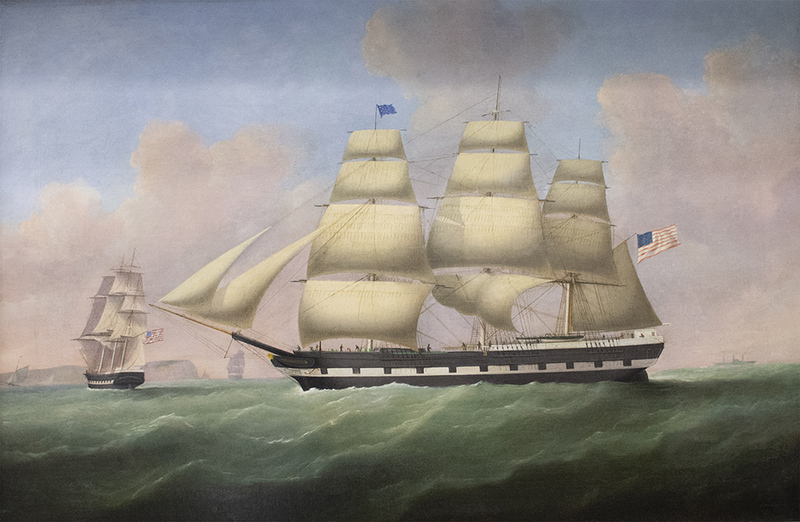 The painting depicts a snapshot in time, when Pelican State was approaching headlands and signaling for a pilot.